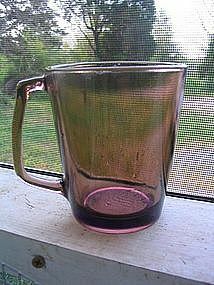 Pyrex Corning 1400 mug. Sorry, the sunlight makes it appear cranberry in places, but I prefer the sunlight to show and find imperfections. The mug has not been used. 4 mugs are available and priced individually. I need your zip code to calculate the postage.